As of this morning there are no broad stock markets around the world that are appealing to me to add positions. The world feels as if it's due for a correction, and I'm fortunate as an individual investor to be able to sit back and wait for a fat pitch. I do not manage money for a fund that demands action every day or every millisecond like a high frequency trading firm. What if we were to have a global "risk-off" sell-off? I think of shares as a small piece of ownership in companies that I will hopefully be giving to my children many decades from now. As Warren Buffet likes to say; the best time period to hold a company is forever. If you are thinking in terms of decades, then you should be thinking about which countries, and the economies within them, will do the best over the next century. I believe the emerging markets will continue to grow at a faster pace over this century than the developed world, thus increasing their total market share of the global stock market. Right now U.S. stocks are worth roughly 50% of the market capitalization of the entire global stock market, while the U.S. is less than 25% of global GDP. Those numbers will eventually find a way to balance, which I believe will occur first with valuation declines in U.S. stocks. While it is tough to explain why in a single sentence, the U.S. has had a 43 year debt fueled binge and one day soon the bill the will coming due for the party. 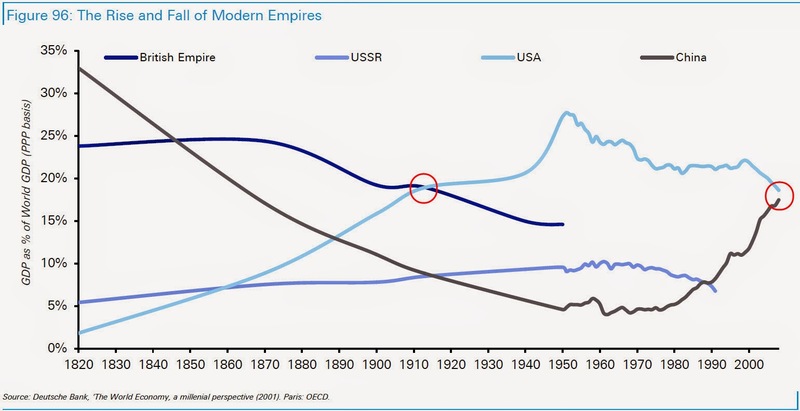 For a more visual way to look at this topic, the chart below shows the rise and fall of modern empires. This is the natural macro economic cycle of the global economy. While the current dominant economic power slowly loses its share of global GDP, new powers emerge to take their place. The U.S. experienced the greatest century of growth in history, with its might peaking in the 1950's. Since then it has been masking the real decline occurring with debt and printed money. Under the surface the rot is real. How Expensive Are U.S. Stocks Relative To Markets Around The World?